Born with a rare neuromuscular myopathy, Jeff has spent his life dedicated to advocating for himself and others with disabilities. 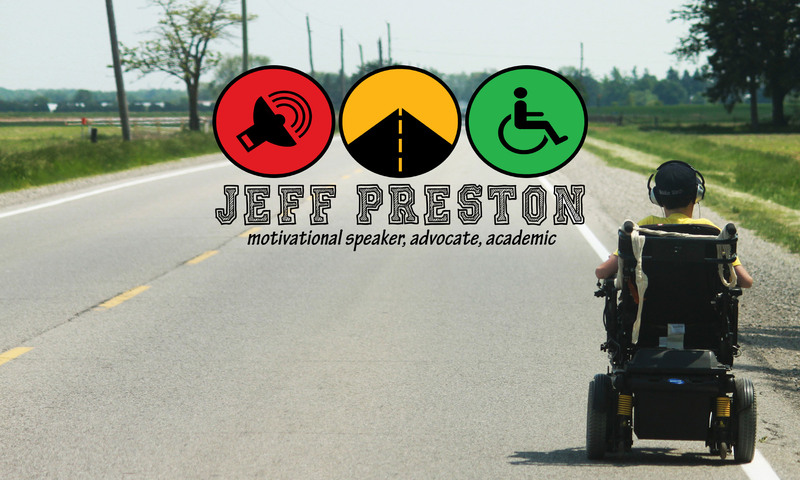 With a PhD in Media Studies from Western University, Jeff's research focuses on the representation of disability in popular and digital culture. Jeff is currently an Assistant Professor of Disability Studies at King's University College @ Western University in London, ON. Let me add my voice to the huge volume of Ontarians currently decrying today’s announced clawbacks/cancellations of social assistance programs (specifically Ontario Works and the Ontario Disability Support Program). I always kind of dreaded playing sports with nondisabled people as a kid. I feared that inevitably there would be that awkward moment when, either compelled by feelings of pity or desires to be inclusive, the players on the other team would oh so carefully miss a pass or stumble while making a save to allow me to score a goal. I would participate in the pantomime, I felt I had no choice, because it felt wrong to chastise these kids for doing something they felt was an expression of their compassion or appreciate of me. Clearly, these moments were designed to make me feel included despite my limitations, but often it just left me feeling more isolated. Where do the disabled belong in London? I was deeply concerned by the rhetoric heard both in and out of public session on Monday evening regarding the proposed Medway Valley conservation plan and felt it necessary to write in and provide some opinion and insight. As you can probably imagine, I was heartbroken by the repeated characterization that disabled people in this city are less deserving of using public spaces simply because we may access them in different ways or that we, as a people, are some sort of annoyance or burden because of our differing needs. Lurking behind many comments, made by both the public and some councillors, were some insidious implications that disabled people do not have the same value as the nondisabled, that we cannot possibly make an equitable world that is accessible for everyone or that the drive to become more accessible would inevitably lead to an ecological catastrophe. I feel there are some important clarifications and explanations missing from this debate and hope to fill some of those gaps with the following letter. It is my interpretation of the Accessibility for Ontarians with Disabilities Act (AODA) and its subsequent accessibility standards that the municipality will eventually have an obligation to provide access to all municipal services or infrastructure otherwise being provided to people who are not currently disabled. The light in the darkness, so to speak, of the AODA is that disabled people have the same right to exist in our city as everyone else and it is our duty, both the public and the private sector, to begin tackling the structural, architectural and attitudinal barriers that functionally disable people. The AODA states it is the obligation of our world to change, not the duty of the disabled themselves to fit within a rigid normative hierarchy of ability. And best yet, the AODA states unequivocally that Ontario must be fully accessible by 2025. From this interpretation, and based on Part 4 Section 80 of the O. Reg. 191/11: Integrated Accessibility Standards, the municipality has an obligation to “ensure that any recreational trails that they construct or redevelop, and that they intend to maintain” follow a set of technical requirements, including ensuring the surface of recreational trails are “firm and stable.” The Standard also states that the requirements do not apply to wilderness trails, backcountry trails and/or portage routes (O. Reg. 413/12, s. 6) and Section 80.15 outlines exemptions from compliance in instances where there may be “significant risk” to ecological integrity and at-risk species (as scheduled by the Endangered Species Act, 2007) in direct or indirect ways. When looked at in the context of the Medway Valley plan, I think the critical point here to note is not necessarily the exemption on ecological grounds but the phrasing around creation and maintenance: I am of the opinion that the AODA does not require the creation of new pathways, especially into areas that are ostensibly not intended to be accessed by anyone, disabled or not, such as ecologically sensitive areas. Given the spirit of the AODA, to provide equitable access for disabled people, the requirement seems to indicate that if the city intends on creating new and/or maintaining existing pathways, places where members of the public are welcome, then there is an obligation to ensure pathway access for diverse means of ambulation. Which brings us to my point: this discussion is not and should not be about the accessibility of pathways. Non-exempt recreational paths must be accessible going forward. Full stop. Building off comments from one city councillor on Monday, debating accessibility is actually “moot” because that debate already happened at Queen’s Park and now it is the law – we don’t really have a say in that anymore, unless we’re interested in going to court. The actual choice here is about whether or not to provide publicly useable pathways. Not who will use them, what they should look like, but whether they should exist at all. Which is where this screed began: do the disabled deserve to access a “natural gem” in the city? If the nondisabled are able and facilitated by the municipality to experience it, then yes, absolutely we do. Morally, ethically, and legally yes, we do. Living with a physical disability has meant that I only get to explore a small portion of London. Many places Londoners take for granted, staples of the community, I have never visited because they are inaccessible. Most of my life opportunities have been decided not by the things I want to do or the places I want to go but based on the arbitrary patchwork of accessibility that has resulted in a minuscule list of places I can physically access. Before I go out with friends, before going shopping, before applying to university, before applying for a job, I have to call ahead and ask if the space is wheelchair accessible. All too commonly, the answer to this question is “I’m so sorry, but no.” Polite as the response may be, what I really hear and see is a city that intentionally or otherwise does not believe people like me are worth, fiscally or physically, the cost of accommodation. I hear and see that I do not belong. Frankly, at times on nights like Monday, I felt like I am not particularly wanted nor welcome. I can access a mere fraction of the freedom enjoyed by the approximately 84% of Londoners who do not have a disability. This is, by and large, because of choices we’ve made about how to imagine our city and who we presume are its residents. Worse still, these are choices we regularly make without asking disabled people about how these decisions will continue to marginalize their experiences and prevent full citizenship. Ultimately, we are not people with disabilities, we are people disabled by system of ableism that prefers to assume disabled people either have everything they need already (we don’t) or that they simply do not exist (we do…and our numbers are growing). And the continued vacillating on tackling the systemic and attitudinal barriers faced by disabled Londoners validates that belief. Every “we can’t afford it” or “now is not the right time” or “this is not the right place” makes us all complicit in this oppression based on bodily formation. London may or may not need city-provided access to Medway Valley. That is ultimately something you will need to decide on Tuesday. But if you do not believe disabled people “belong” there, then I implore you ask where do we, disabled people, belong? If Medway Valley is one of the few spaces that we cannot accommodate, and you genuinely agree that the disabled do in fact belong in London, then I urge you to make up for this one ecological limitation by committing to resolving some of the countless other barriers that we can remove – we just have to stop finding excuses not to. Screenshot of the deleted “Bye Felicia” tweet, address omitted. To celebrate St. Patrick’s Day, the London Police took to social media, spending the day tweeting out funny images and updates around their “Don’t Invite Us” campaign to curb student rowdiness in the city. This was all well and good until mid-afternoon, when one tweet boasting the shut-down of a student party used the phrase “Bye Felicia” and included the street address of the house party. Upon seeing the tweet, my reaction went from “hehe” to “cringe” to “…yikes, that’s offensive” in the span of about five seconds. While this may seem like an innocuous (cute? sassy?) inclusion of a popular meme, the tweet raised eyebrows around the city, largely rooted in the racial origins of the “Bye Felicia” meme and the flippant public shaming of people being fined by police. Intentionally or otherwise, this tweet is wrapped up in some complex racial history that left many with a bad taste in their mouth. Shortly after posting, the tweet was deleted. Earlier this week, a stub of paper was slipped under my office door — it read “Your wheelchair is RAD”. I snickered, thought it was cute, and felt that whoever decided to share this with me (presumably a student) really “got” me and my sense of humour. But this little slip of paper has some increased significance given the proximity its receipt has to today: International Day for People with Disabilities. I don’t typically celebrate this day. It doesn’t feel like a holiday and it’s at least a bit disheartening that the largest minority in the world rarely even gets their day mentioned on the news, let alone receives any sort of pop culture acknowledgement. Perhaps this day shouldn’t be just about “raising disability awareness” among those poor souls who haven’t joined our ranks yet. Maybe this should be about celebrating us, “the community,” and all the amazing, staggering and radical things we have done over the past year to push back against the ableism that lurks outside the comfortable confines of our accessible home spaces and work places. Today, let’s not celebrate the rad chairs. Or the rad walkers or rad crutches. No need to fete rad prosthesis or rad hearing aids or any of the other rad devices Yes, they can be cool and yes they are liberating, but these are all just tools. They’re devices that some people use and others don’t feel they need. We, the users, are the ones that make them radical. We make them radical in the ways we use them to oppose a society that says we do not belong. We MAKE them rad because our very existence is a radical act of opposition against normative and eugenic ideologies that have long attempted to eliminate us. Adaptive devices are tools of resistance, yes, but we the users are the true radicals. So I dedicate today to everyone who radicalizes their tools and uses their devices to confront the disabling aspects of our world. I dedicate today to those who demand a world where using a device doesn’t have to be a radical act. I dedicate today to the radicals that we lost in 2017 and to those who will continue to be radical into 2018. And last but certainly not least, I dedicate today to all of those who taught me, trained me and inspired me to be a little radical too. Just in time for the weekend, new changes were announced to the Ontario Disability Support Program (ODSP) that would eliminate some of the more punitive restrictions that, in my opinion, contributed to people getting stuck on the program. The biggest change comes in people’s ability to save money and assets while receiving ODSP support; whereas previously users could only save up to $5,000 before losing their monthly benefit, now individual users can save up to $40,000 in cash and/or assets without affecting their monthly stipend or medical benefits. Credit where credit is due — this is a really important change to ODSP. By allowing people to save/hold more assets, we’re enabling people to have a better standard of living. Not only that, this increases the chances of young people with disabilities being able to attend post secondary school, as most would need to save a lot more than $5,000 per year to afford the cost of university/college. But much like the Registered Disability Savings Plan (RDSP), my main concern is that the benefits of these changes will not be felt by most on ODSP, disproportionately helping the small percentage of users that already benefit from familial, financial and social privilege. These changes (and RDSPs more generally) are great for people who have pre-existing access to money through family/friends, a group of people I suspect are already well positioned to manage. But just like how those scrapping by exclusively on the monthly stipend from ODSP do not have enough money to regularly make deposits into an RDSP account, these changes will not be greatly felt when a vast majority of one’s “earnings” are going to cover day-to-day expenses with very little left over to save. To put this into perspective, ODSP recipients are only entitled to a maximum of $1,050 per month; with most one bedroom apartments renting for over $700 in London, that only leaves $300 to cover transit, food, clothes and other needs. Without significant increases in housing & spending allowance, I fear these changes are more of a PR stunt and many on ODSP will not see any tangible improvement in their quality of life. So credit where credit is due, but there is still much to be done.